I always told myself that as soon as I knew I was capable of winning the Sportsman class in an enduro that I would move up to Clubman. I took my first ever class win in 2014 at the Powys Enduro, so I'm looking forward to the bigger challenge of competing in the Clubman class in all enduro events in 2015. From what I've heard, the WTRA Snowrun enduro is far from easy, being billed as an "old-school" event (read difficult)! It'll be a real test of fitness, but it's what I need to kick-start my season. This will be my first attempt at the Snowrun too, so I'll be concentrating on finishing. As far as the ATRC classes go, I moved up a class and rode in the Good Experts at the Cambrian Rally and got on well, so I will stick with that class in 2015. 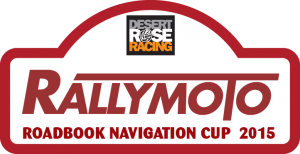 I don't know how the class structure will be defined for the RallyMoto Cup as yet, but assuming it's similar to the ATRC system, I'll enter as Good Clubman or Expert depending on how much roadbook practice I've been able to get in before the first event. Meanwhile in South America...THE DAKAR RALLY 2015 IS UNDERWAY!! !